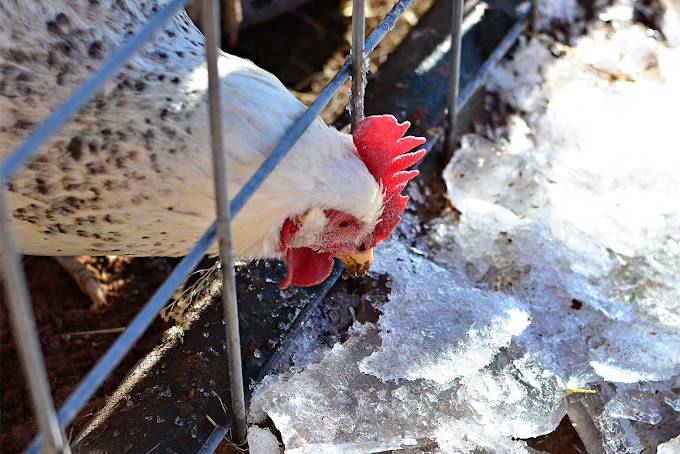 The 7MSN Ranch: Why did the chicken stick her neck through the fence? Why did the chicken stick her neck through the fence? To get to the ice on the other side. My chickens are so weird that nothing they do surprises me anymore. They are obsessed with water in all its forms. 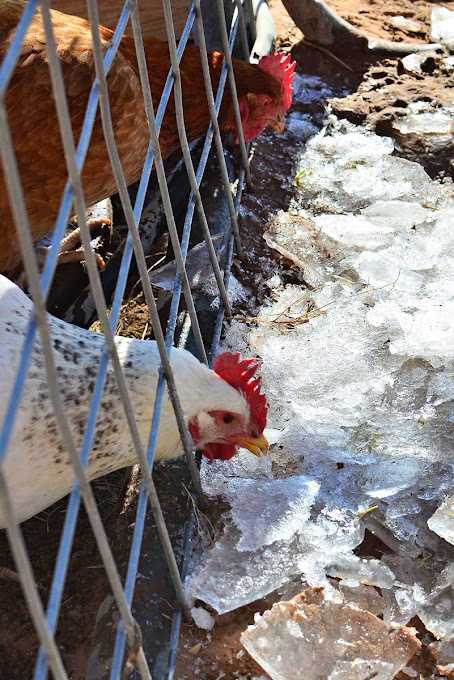 Perhaps the ice I've been removing from the stock tank these recent mornings helps to cleanse their palates. Eugenia: I'm certain the folks at home would rather see me eating a snow cone than a tarantula or a mouse. Me: Your point is well taken. Go lay an egg and we'll call this post done. Good to see the Ladies again. Nice pics. Reminds me of my dog--she'll eat so much snow or ice she starts shivering. Anything to fill the ol' stomach--or crop, in this case. My dog loves to eat ice. It's our cheap treat. She also pulls chunks from an outdoor fountain, once eating so much she began to tremble from the cold. Dilly sog! Good morning, pretty ladies. I've never spent time around chickens, but I feel like I know these girls. Always happy to see them. Theresa...chickens are omnivorous and have been known to cannibalize each other. They are scavengers. 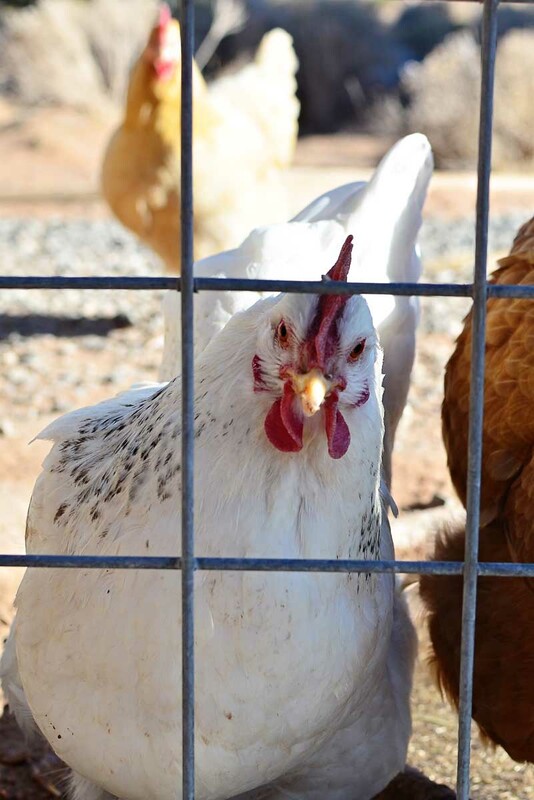 It's a dirty chicken secret most people don't know, which is why I always chuckle and shake my head when I see eggs advertised as coming from chickens that eat a "vegetarian" diet. Chickens are NOT vegetarians. 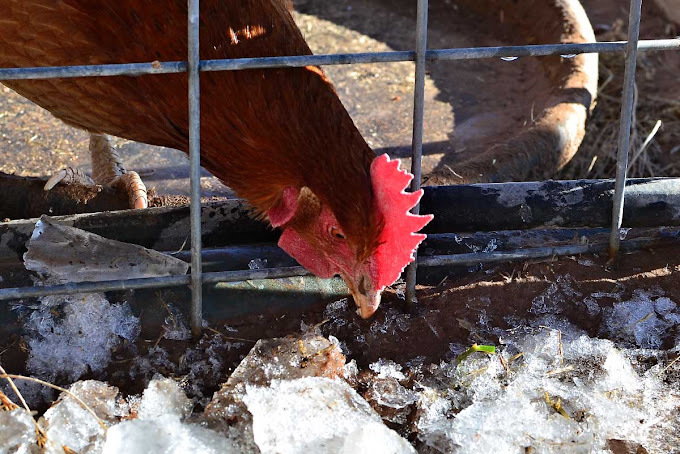 The things I've watched my chickens eat...oh boy! I love 'em and love the eggs, no matter what they decide to gobble up. Tyrannosaurus rex, meet the chicken - your third cousin more than 100 million years removed. A new family tree based on protein sequences recovered from dinosaur fossils firms up the dinosaur's avian lineage. "Palaeontologists have known this overall connection. We have now confirmed it with molecular data," says John Asara, a biochemist at Beth Israel Deaconess Medical Center in Boston, who led the study. His team compared sequences of a collagen protein recovered from a 68 million-year old T. rex fossil and a half-million year old mastodon (a kind of extinct elephant) with those same sequences from 21 modern animals - including chicken, alligator, elephant and human. may be an explanation for the egg size at lease? and eating ice? Ok, learned something new about chickens today! They are very nice looking too!